I didn't eat much yesterday, as the appetite wasn't there. I was still paying for the bad food I ate over the weekend. However, by mid-afternoon my stomach seemed to have settled down. So by evening, I felt hungry enough to eat something. I had two whole wheat english muffins, and then later on two packets of instant oatmeal, and then a bottle of water. It was a total of 500 calories. 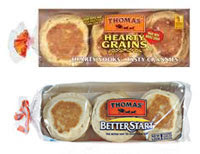 Thomas' English Muffins has several different lines of muffins, two of those lines are called, "Better Start" and "Hearty Grains". I've tried both. The odd thing is that the Hearty Grains uses the words "Double Fiber" on the package, which equates to 5g of fiber, and has 27g of carbs, for a total net carbs of 22g, and 120 calories. But the Better Start has 8g of fiber, and 24g of carbs, for a total net carbs of 16g, and 100 calories. The Hearty Grains is made with "Whole Grains", while the Better Start is made with "Multi-Grains". However, the Better Start doesn't mention anything on the package about it's higher fiber content. It seems like Thomas' would put greater emphasis on the fiber content of this line, instead of doing so with the Hearty Grains line. If you were at a grocery store looking at english muffins, you'd think the Hearty Grains was more healthy just by looking at the words on the packaging. Anyways, the Hearty Grains muffins taste better with its sweeter flavor, and is more nutritious for its whole grains, but the Better Start is obviously better for dieting with its higher fiber, and lower carbs. Unfortunately, the grocery stores around my town seem to stock more of the Hearty Grains, while the Better Start is harder to find.